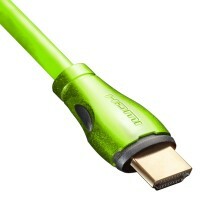 The Radiant Color Coded Cables feature the latest HDMI technology. It supports full HD 1080p with transfer rates up to 340MHz (10.2Gps), Dolby True HD and DTS-HD Master Audio, and is HDMI version 1.3b and Cat. 2 certified with deep color support up to 12-bit color depths and XV ColorTM. Premium OFC (Oxygen Free Copper) conductors and 24K gold plated connector for excellent conductivity. A triple shield protection (double foil shield and high-density aluminum) braid offers maximum isolation from electromagnetic interference (EMI). 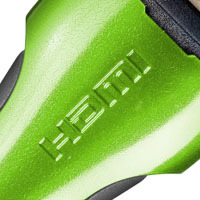 As high definition (HD) technology has become the norm for most home theater systems, HDMI cables have emerged as the most popular HD connection cable as they can transmit both HD video and surround sound audio. 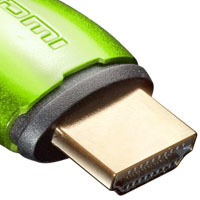 The problem now is that because most components use an HDMI connection, running multiple HDMI cables between components can be confusing. The Radiant Color Coded HDMI Cables eliminate this problem, allowing you to use a different color cable for each component. Whether you're connecting a cable or satellite receiver, HDTV, stereo receiver, DVD player, Blu-ray player or PS3 to your home theater system, you can quickly identify the components you're hooking up based on the color of the HDMI cable you are using. 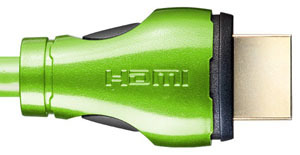 These vividly colored cables are proven to be durable and offer a compact, flexible design with connectors that won't easily slip or wear - a perfect choice for quick installations on any home theater component using an HDMI connection.